We stepped off the plane at 6:30 am to 95 degree heat plus humidity. Dukes has a fabulous infinity pool at the beach we used daily. The staff are first class, hotel and grounds beautiful. This was my second time staying at the Sheraton Grand and it was awesome! I will definitely be back. This place is great! Clean. Great service. Good food. very nice place will come there more often.did not have enough time to explore everything there is.will make more time in next visit t fully enjoy its amenities. The most populated city in the United Arab Emirates, Dubai has become a world-class destination for reasons too numerous to count: crisp white sands, shopping malls that feel more like entire cities, and a global mish-mash of cuisine. 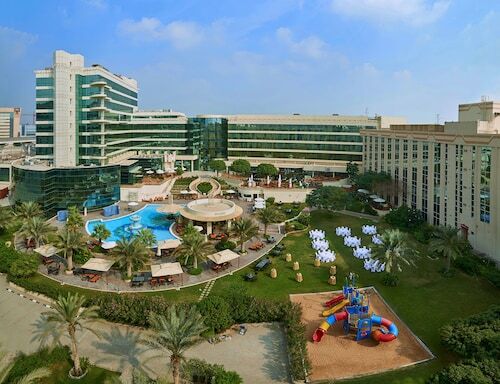 Located right next to the Persian Gulf, it's a center grounded in both modern excesses and historic Bedouin tradition. Whether you're enjoying a lazy afternoon at Jumeirah Beach, gazing up at the record-busting Burj Khalifa building, or rummaging through diverse street-side souqs for golden trinkets, Dubai will not disappoint. The Palm Islands are two man-made islands built off the coast of Dubai, fanning out in the shapes of palm leaves. Booking a stay at Dubai hotels in the Palm Islands gives you the exotic beach experience straight out of the glossy brochures. Enjoy nearby attractions such as The Lost Chambers Aquarium with the entire family, or take a day for yourself to relax at 5-star spas inside hotels like Atlantis The Palm: this is luxury most people have hardly seen. The world's tallest tower, Burj Khalifa, dwarfs the surrounding skyscrapers. This marvel of modern architecture has the highest viewing platform in the world at an appropriately named venue, “At the Top”. Learn the history of the building during the elevator ride up the 124 floors, before being confronted with truly unrivaled views of the city and ocean. Spend the rest of the afternoon perusing souvenirs at the mall located at the base of the Burj and your day is complete. For a day exploring the urban atmosphere of Dubai, visit the Global Village shopping center. Serving as the city hub for entertainment and cuisine, it's open from November to March every year, and many vendors bring their handicrafts here. Surrounding countries bring their goods to the Global Village market and you can also find rollercoasters, fireworks, concerts and fashion shows through the winter months, which makes it a popular escape for those suffering the colder weather of the Northern Hemisphere. Otherwise known as DSS, this is a family extravaganza during August that sees the city's renowned shopping complexes like the Dubai Mall taken over by children's performances, specialty foods and activities, as well as big shopping discounts that draw the retail-hungry crowds. This is the best location for those traveling with their families. Featuring a playground and safe swimming pools, your children can splash away while you savor a few long drinks by the poolside bar. With tennis courts and a gym located on the premises, even your daily workout routine doesn't get interrupted. This is the best beach to stay at if you're vacationing solo or as a couple. Complimentary water, towels and lounge chairs are available to those who make reservations at this private beach. Rent a pair of jet skis or kick back, James Bond-style, on the deck of your rented speedboat. In Dubai, the summers are what you would expect from a desert climate, but because of the Persian Gulf, the air is also humid. The highs during the day hit about 106 degrees Fahrenheit on average, with nights cooling down to about 80 degrees. The humidity is not as strong during the winter, and the temperature can reduce to the 50s and 60s in December through March, as well as being the time to come for the Dubai Shopping Festival and Global Village.